← Our Entry for the Knight News Challenge: How can we harness data and information for the health of communities? In urban areas such as New York City, many corner stores (“bodegas”) offer prepared or ready-to-eat food. In studies of the food environment, researchers usually consider bodegas as grocery stores, and compare them with large stores such as supermarkets. But many bodegas sell packaged ready-to-eat items or prepared food from deli counters, salad bars, or steam tables – in other words, they fill a similar niche in the food environment as fast food or take-out restaurants. What would happen, we wondered, if we compared the nutritional environment of bodegas to that of another outlet type well-known for offering inexpensive and convenient food – national chain fast food restaurants? With support from an ARRA supplement to our grant from NIDDK, as well as from the ISERP summer intern program, we sent five student interns into the field to find out. We used the NEMS-R (Nutrition Environment Measurement Study for Restaurants) audit protocol for both fast-food restaurants and bodegas. A widely used tool for evaluating nutrition environments, the NEMS-R measures the availability of healthy food and beverages (e.g. fresh fruit, low-fat milk). It also looks for ways a food outlet might prompt or incentivize healthy or unhealthy eating, for instance by providing calorie counts or offering “all you can eat” specials. Along with Laszlo Lovasi and Karla Milinkovic, who managed the fieldwork, the students audited more than 200 bodegas and fast-food outlets in Manhattan, Brooklyn, and the Bronx. What we found illustrates the value of measuring the nutrition environment in multiple ways. On average, the total NEMS-R scores were about the same for the two types of food outlets (bodegas: 13.09, fast food: 14.31, p=0.22). But fast food restaurants scored significantly better than bodegas on providing nutrition information, while bodegas provided more kinds of healthy food and were less likely to use price incentives or promotions to encourage unhealthy eating. Bodegas are a major presence in many urban neighborhoods. 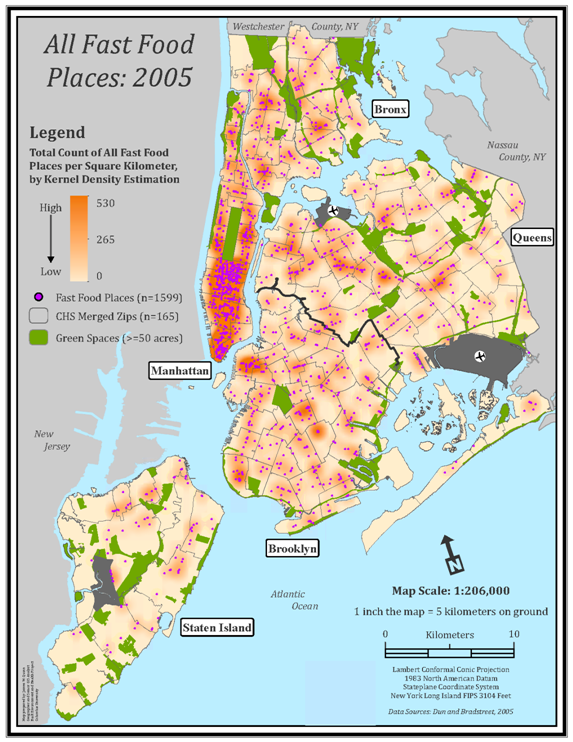 In a previous study of food outlets near NYC schools, we found that the density of bodegas was about 10 times that of national chain fast food restaurants. Omitting bodegas and other small grocery stores from measures of the restaurant environment significantly understates the availability of ready-to-eat foods. We conducted this study in 2010, after two policy initiatives that are likely to have affected these results. In 2008, NYC began to require chain fast food restaurants to post calorie counts. In 2009, New York State was the first to adopt the new “food package” for the WIC supplemental nutrition program, which includes more fruits, vegetables, and other nutritious food, and has been associated with healthy food availability in small stores that accept WIC. Our research identifies key next steps for improving the nutrition in these two types of outlets. Priorities for fast food restaurants are to reduce the price incentives for over-eating and increase availability of healthy food. For bodegas, provision of healthy entrees, healthy food promotion, and nutrition information are more appropriate foci. This entry was posted in Food Environment. Bookmark the permalink.